Are you full of it? You might quickly reply, “That depends on what ‘IT’ is . . .” The Scriptures make it clear that there is much we are to be filled with as believers in the Lord Jesus Christ. After we receive the Holy Spirit at our conversion, God begins the life-long process of growing us into maturity and conforming us to the image and likeness of Christ. In other words, we are being filled with Christlike character. What a wonderful metaphor the apostle Paul uses to describe the character and conduct of the believer! So . . . how fruity have you been lately? Are you full of it . . . “it” being the Spirit of God? 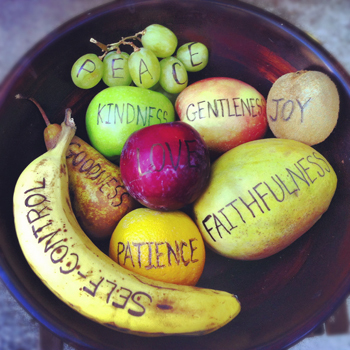 Here’s another question: how many fruits are on Paul’s list? We see nine individual fruits listed, but in the original Greek there is only ONE. As I sat under the teaching of my friend, Greek professor, and Knox Seminary president, Dr. Sam Lamerson, I learned that the Greek word for “fruit,” karpos, is singular here. Paul is identifying a group that goes together as a unit, not separate individual units. We must remember that God is at work within us “to will and to work for His good pleasure” (Philippians 2:13 ESV). God is the One who is working this grace in our lives. To be sure, we cooperate with God by actively seeking to grow to maturity, using all of the means of grace He has given to us. But it is never the means that grow us up; it is always our Master and Lord, Jesus Christ. All of these graces flow through the believer as a single unit, making us a new creation in Christ. And just as our salvation began with “For God so loved the world,” you and I cannot have the love of God in Christ Jesus without joy . . . or peace . . . or patience . . . or kindness . . . or goodness . . . or faithfulness . . . or gentleness . . . or self-control. Love is the foundation upon which all of these graces grow. And yet upon closer inspection, we can all see some aspects of this fruit in our own lives that are stronger and more evident than others. Some areas are simply more developed than others. In my own case, those who know me best might suggest that patience has been taking a very long time to come to fruition! How is it with you? In what areas are you strongest and where are you weakest? You need not fret over your self-discovery, because God is at work within you, and is He not finished with you yet! What God began in you, He has promised to complete (Philippians 1:6). Should you realize that you are a bit deficient in the “fruit department,” simply focus more on the grace of God growing you in that area. Paul wrote that “Christ’s love compels us” (2 Corinthians 5:14), and the more we focus on His love for us, the more we bear the fruit of the Spirit to those we come in contact with. The grace that saved you is the same grace that is growing you and filling you with the Spirit of Christ. The first guarantees the second!